Lock in a great price for Hotel Weber Ambassador – rated 8.4 by recent guests! 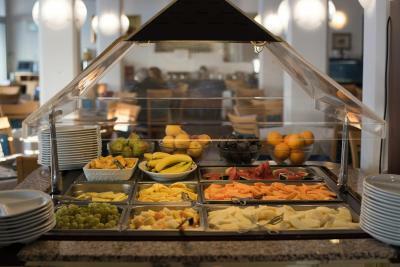 loved the breakfast buffet. All the food and drink you can imagine! Loved the balcony off our room with the lounge chairs, table and fantastic view of the little private beach below. 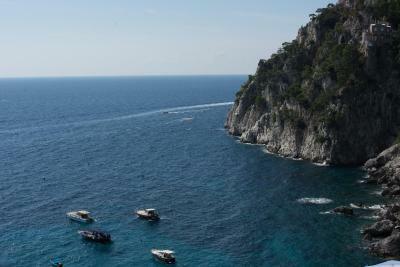 The shuttle service was a great bonus for only 5 euro/each to/from the harbor and free into town. Location was great. Views are beautiful. Staff was excellent. Location !! The room was small and we had a sea view room but for the price , it was a deal ! 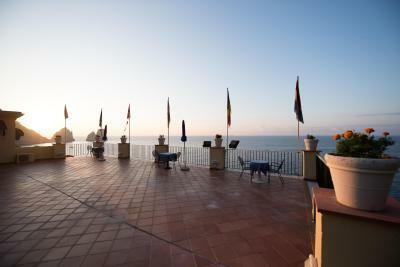 This property Is located right on Sea. The small beach is a 5 min walk and its just damn lovely . We swam and sun bathed and ate great food . 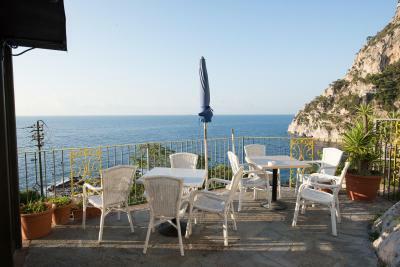 The property is on the opposite side of the island away from the tourist sites, So you get a feel of seclusion, they provide shuttles to cart you to the Marina and the city center . Breakfast is great and Dinner is pretty good. Overall its damn good place to stay . The pool is big enough to swim laps , so. 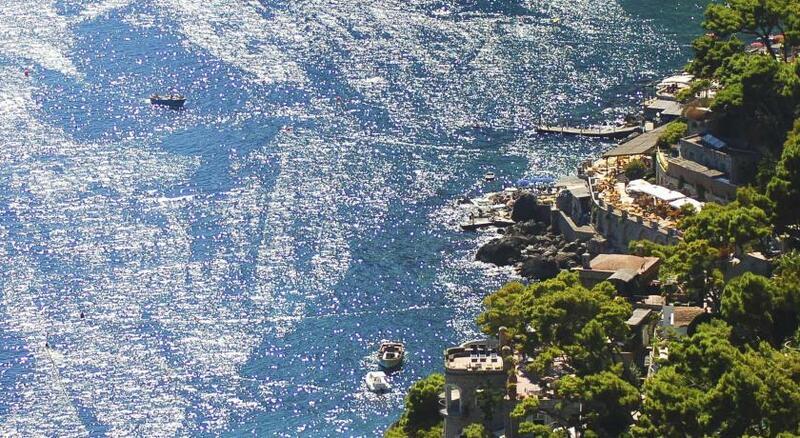 you can swim laps and then cruse down to the sea for a nice dip and sun bathing . the staff is helpful and kind . 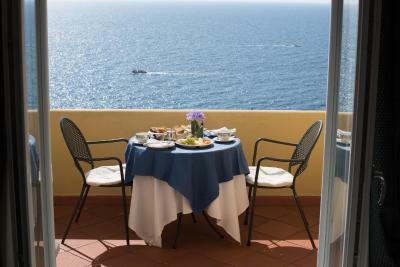 The main benefits for staying at this hotel is the gorgeous view of the Faraglioni rocks from our bedroom balcony, the affordable cost for the location and the complimentary shuttle service to the center of Capri. All in all-the hotel has a great location at a lower price..and they are riding on that one thing going for them for now. I would stay here as a last option if you are tight on money. It is in a gorgeous location. 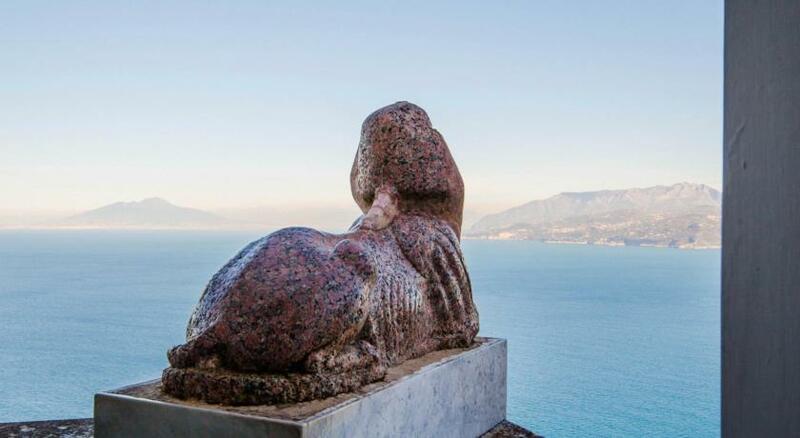 It’s on the Anacapri side which is much prettier. Location. Location. Location. And the best van services to the town center which is a good ride up a hill. 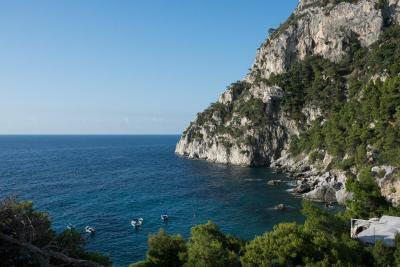 The small beach is just down the hill from the hotel and its a beautiful walk. 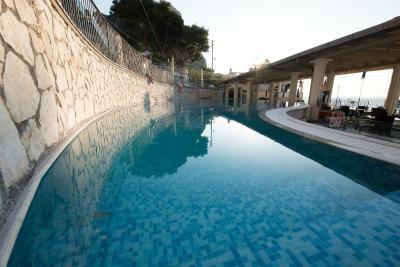 The pool is large enough to do laps. 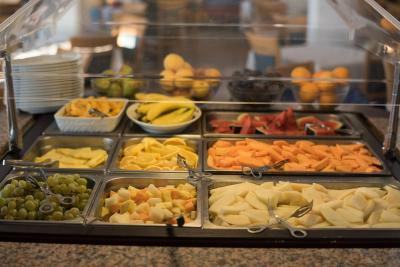 The pool restaurant offers great food at very reasonable prices! Mostly everyone there is nice except a few restaurant people who are not too friendly when you ask for a bucket of ice--yes, no ice on the hotel room floors! But everything else is perfect! 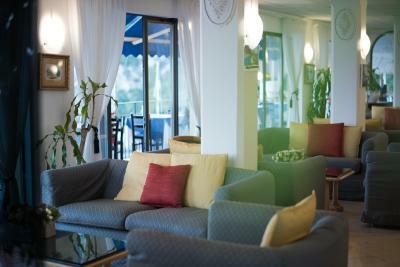 They are situated in Marina Piccola with beautiful views of the famous Faraglioni. 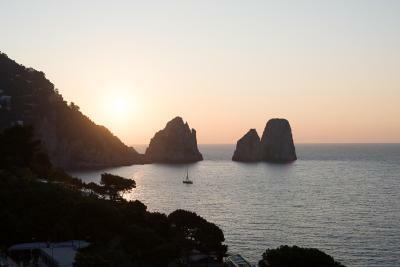 The hotel provides a shuttle service from the hotel to Capri center every fifteen minutes. 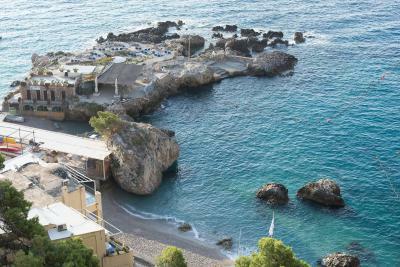 There are excellent restaurants and swimming spots right by the hotel. Absolutely wonderful view out of the window! 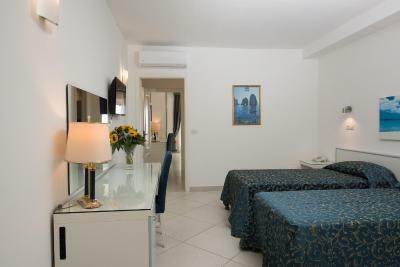 Very clean and warm place to stay, very close to the beach. 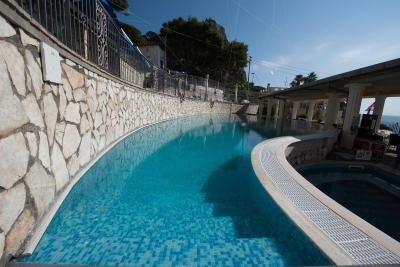 Swimming pools and free carpets for the beach are very handy. Stuff is nice-speaking and smiling. The shuttle was very useful and location was close enough to the beach. Staff was very friendly and able to answer all the questions. While having breackfast the servers were very helpful. I will come back. Absolutely everything; can't say enough. Meals way above average.We ate breakfast and dinner every day of our stay; Make sure you make reservations as the dinning is very popular with a different menue every day; take the first page recommended; you will be presently surprised with the quantity and taste.Everything is fresh and service is excellent way above average;the dinner bottled wine is very fairly priced and above average. 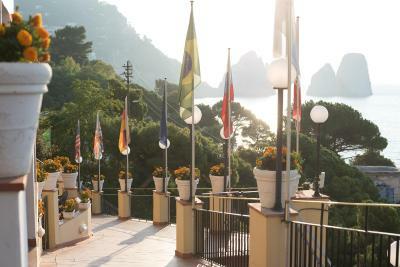 The car service anytime to the port or town for shopping is free both ways.We can't wait to stay here next year. Hotel Weber Ambassador This rating is a reflection of how the property compares to the industry standard when it comes to price, facilities and services available. It's based on a self-evaluation by the property. Use this rating to help choose your stay! 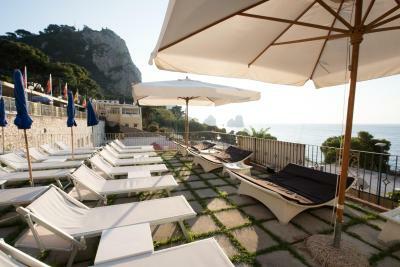 One of our top picks in Capri.The 4-star Weber Ambassador overlooks the bay of Marina Piccola and the Faraglioni rocks. 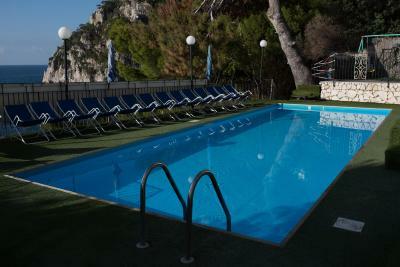 It offers a free shuttle to/from Capri center, and free access to its 3 pools, 2 hot tubs and fitness center. 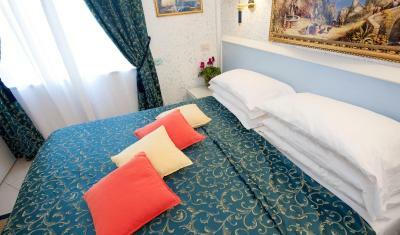 Spacious rooms are air conditioned, and feature an LCD TV and private bathroom. 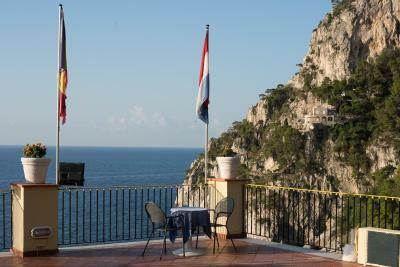 Most come with a balcony or terrace, and some have views of the Tyrrhenian Sea. Wi-Fi is available. 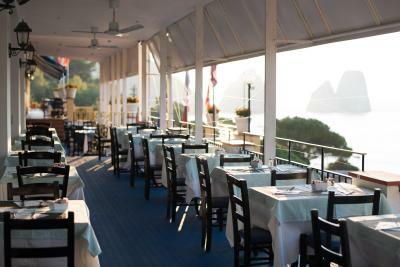 The property is complete with 3 bars and an international restaurant specializing in fresh fish dishes. 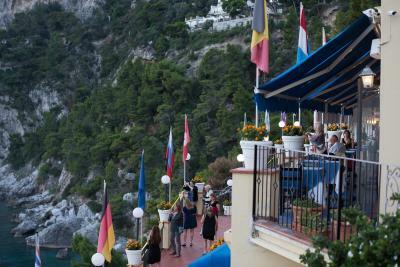 You can relax at the on-site hair salon, or take in the panoramic view from the terrace. 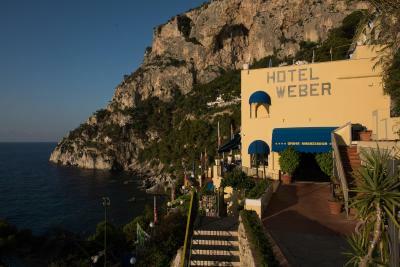 A stairway from Hotel Weber Ambassador takes you directly to the beach shore. 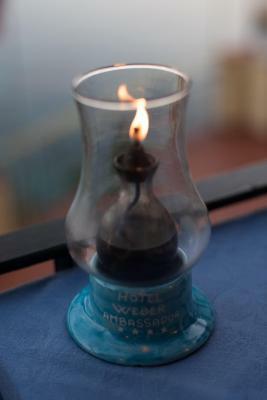 When would you like to stay at Hotel Weber Ambassador? 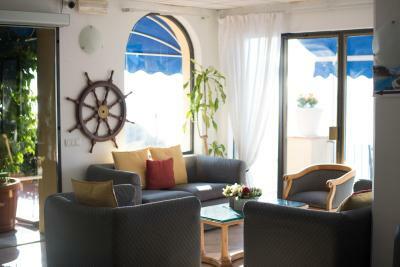 Air-conditioned room featuring a frontal sea view, flat-screen TV and private bathroom. 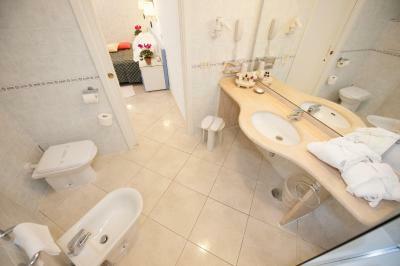 Air-conditioned room with internal view, flat-screen TV and private bathroom. House Rules Hotel Weber Ambassador takes special requests – add in the next step! Hotel Weber Ambassador accepts these cards and reserves the right to temporarily hold an amount prior to arrival. 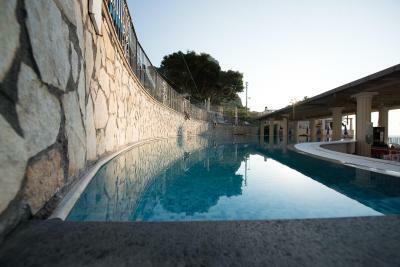 Please note that the pools close at 18:30 daily. The pick-up service from Marina Grande wharf is available at extra cost. Massages are upon request and at extra cost. 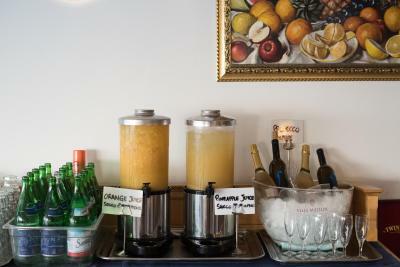 When booking a half-board option, drinks are not included with meals. We were greeted by Nicola at the check in and he was so friendly and helpful!!! He made our stay that much more enjoyable. He even let us check in before the check in time! The location is perfect, the views are spectacular, rooms were so clean and well kept, & breakfast was delicious. I recommend this hotel for sure! Say hello to Nicola! We didn’t have any hot water, and the AC wasn’t working, wouldn’t have been a problem however when we were staying it was quite cold, which resulted in catching cold. The location was seriously breathless, and the staff were very accommodating especially with the shuttle! 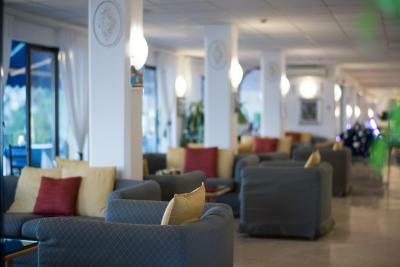 The hotel was great also tge staff were very helpfull and pleasant. 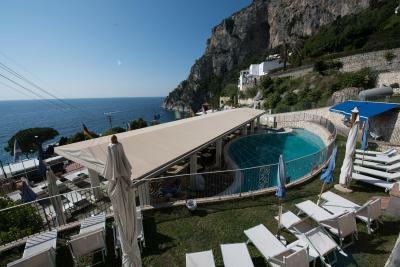 The free taxi service was brilliant as was breakfast great facilities and the location was perfect so close to the beach. no complaints except everytime we shower, we have a flood, the shower door needs fixing! The sea view was amazing!! Beach nearby is gorgeous. Views are stunning. 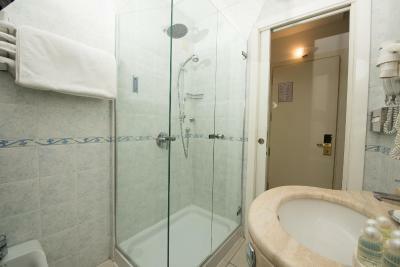 The shower in the room we had is kinda antiquated but for what we paid its not bad . Overall no real complaints . Though food was great, service was a bit slow. The daily menu fantastic value for money. 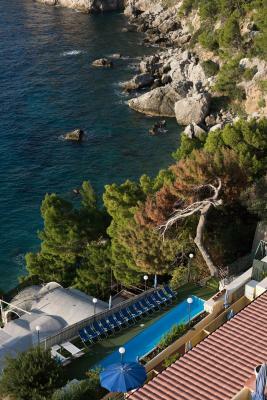 On the quiet side of the Isla d with great access to beach for swimming. Staff were very helpful. The property itself is very dated and in desperate need of an upgrade to keep in line with considering itself a 4-Star hotel. The carpet in the guestroom corridors is saggy and proved to be a trip hazard for my travel companion, and the outside stone staircase needs to be illuminated for safe walking in the evening. 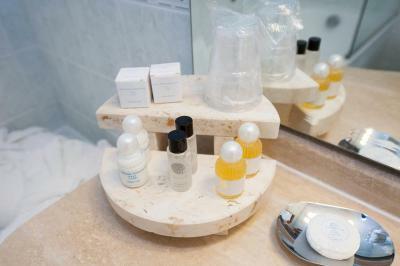 The customer service above all needs an overhaul more than the appearance of the hotel. 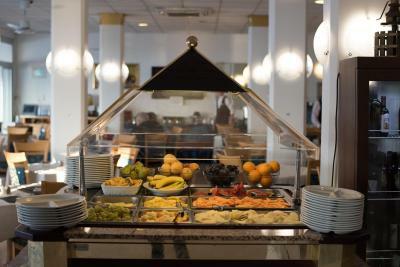 The staff in the restaurant is quite rude, and declined one of the women in our party to re-fill her water bottle after we had just paid for our breakfast there because he was 'too busy closing down the buffet.' We also requested the front desk to make a reservation for us at the Verginiello restaurant that was recommended to us...and the lead attendant (a shorter, brunette haired man), assured us it was not necessary- even on a Saturday night. 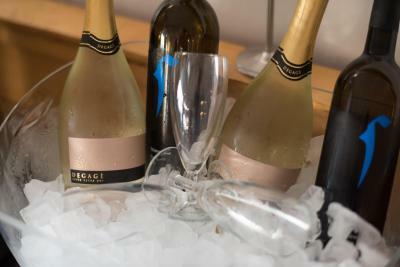 He was wrong- the manager at Verginiello said that it was too bad we were staying there & gave us free prosecco while we had to wait 30-40 minutes to be seated. 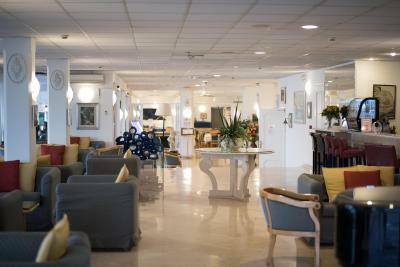 2 Staff Members that we really were impressed with was a young black man who helped us with our luggage, and a tall, short haired Italian man who greeted us in the lobby daily. Customer Service is KING and will always outshine everything. Train your restaurant staff to treat guests like family and to take pride in their work, and you will immediately improve many reviews. The pool and hot tub are a HOT MESS. One staircase on the other side of the pool was blocked off with a pile of dirty pool furniture, so you couldn't use it, and the 'hot' tub, was lukewarm and had a pile of about 40 floating dead bees in the corner that everyone tried to avoid. There is a HUGE bee problem near the pool, they really should put out some natural bee traps to keep guests more comfortable. The shuttle from and to the port is not free and is not expensive but I didn’t know until check out. The restaurant is not that great and is the only restaurant open at night in that area.